I have also bought original artwork from David Rowe... the Delta and Speedball artworks. Sadly, no I haven't. I wouldn't mind his Highlander artwork though. Though he may have sold his originals, he still has slides of work available for reprints - so I s'pose it's not the end of the world. Infogrames bought out Ocean (and other software houses), so it's possible they have a the original or digital equivalent of Bob's Ocean logo. Meth wrote: I have also bought original artwork from David Rowe... the Delta and Speedball artworks. Though the Delta artwork isn't Amiga related, I'm wondering if a new section on ExoticA is a worthwile project? Scans of original artwork? That is of course if the purchaser of the artwork is prepared to scan? XtC wrote: Though he may have sold his originals, he still has slides of work available for reprints - so I s'pose it's not the end of the world. But yes.. if reprints are wanted then i think it's best to get them from the artist directly like with Wakelin. 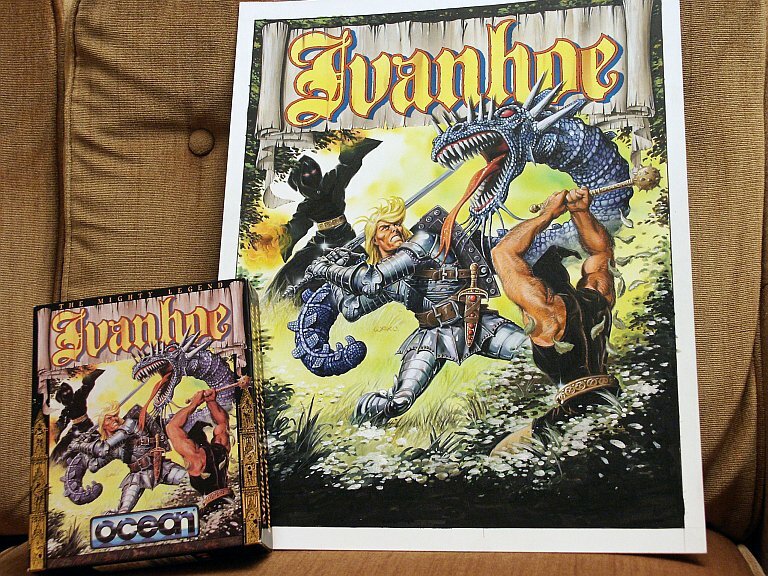 The Ivanhoe artwork is too big for my scanner... but i tried to photo it with my digital camera with bad results... the artwork is slightly bend, i did not fixthat before taking the picture and it's become a little shiny in the upper right corner. Also the Speedball artwork is not in mint condition anymore, but Delta looks like new. I don't have the Speedball logo since it's lost... David thought the Bitmaps might have kept it or something? And about prices.. i must mention that i recently got in contact with Steinar Lund and he wants £2000 each for his original artworks.